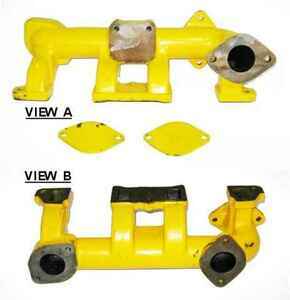 This triple outlet manifold replaces OEM part numbers G2042 and A39231. For tractor models 430, 470, 480, 480B, 530, 570, 580, 580B, 310D, 310E, 310F, 310G, 420B, 420C, W3 Wheel Loader. This is for a gas engine. Replaces OEM# G2042. Gasket Set Sold Separately. This unit is made to fit multiple applications and may have more ports that your tractor needs, comes with block-off plates for those ports not used. New, aftermarket Exhaust Manifold for sale with a solid manufacturer warranty. In addition, we have a generous 30-day return policy if these Case Exhaust Manifold for Case 430, 470, 480, 480B, 530, 570, 580, 580B, 310D, 310E, 310F, 310G, 420B, 420C, W3 tractors needs to be returned for any reason. Please see our Parts Warranty and Return Policy links on your left for complete details before returning.